While visiting an archeological dig in Egypt, the Chans search for the missing golden mummy of an ancient pharaoh, facing a curse in order to solve the theft. There are a few plot elements in The Mummy's Tomb that refer to some seen in Charlie Chan in Egypt (1935), starring Warner Oland. Temple of Ramsses II- One of six temples built between 1264 and 1244 BC in Nubia in southern Egypt during the reign of Pharaoh Ramesses II. An animated version based on this temple is seen in "The Mummy's Tomb," and is referred to as "the Temple of Ramossis." Lord Redgrave: "This is the Temple of Ramossis, one of the earliest pharaohs." Lawrence of Arabia - A 1962 British-American epic film and winner of seven Academy Awards based on the life of T. E. Lawrence. 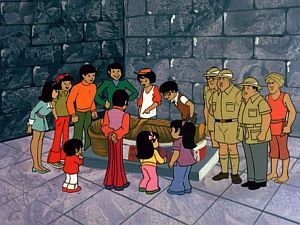 Charlie Chan (to Pendrake): "About the curse of King Tut's tomb..." Although this was the only time it was mentioned in this cartoon, Chan's reference is in regard to the famous "curse" related to the discovery by British archeologist Howard Carter and the opening of the tomb of the boy pharaoh, Tutankhamun in 1922.